Five friends reunite and decide to take a sailboat to an island that not many people visit since it is very far out at sea. Once they get to the island, everyone has fun in their beachwear, admires the azure scenery, and inhales the salty breeze—so pictorial, some of the shots look as if they are ripped right out of a Ralph Lauren ad. Luke (Damian Walshe-Howling) and Kate (Zoe Naylor) even have some time to flirt and ponder over their once formidable romantic relationship. The two obviously still have feelings for each other. But there is a problem: Luke notices that the tide is dropping fast which means that the boat is in danger of getting its keel damaged by the corals. All quickly get back to the boat, relieved that it is undamaged—or so they think. What I liked most about “The Reef,” written and directed by Andrew Traucki, is that it manages to build a certain level of intensity even before the shark appears in the water. When the boat capsizes, it happens so suddenly, I found myself as disoriented as the characters. Prior to that point, the picture allows us to relish on open spaces that look bright and safe—images one can expect from a perfect tropical vacation. When the boat overturns, however, we are bombarded by bleak colors, a tight space, and neck-deep water. Due to the sudden shift in images, the filmmakers are successful in injecting horror as we begin to question what we might have done differently, if any, if we were in the characters’ full foot fins. Just what exactly are you supposed to do when you are the middle of a vast ocean and your boat has turned upside down with little to no means of rescue? Part of the fun is that the picture allows the characters to consider the possibilities instead of simply jumping to a course of action just because they panic or—worse—that hackneyed excuse of “staying together.” Warren (Kieran Darcy-Smith) decides that he is going to wait. This seems logical because he has a device that can grab planes’ attention if they happen to be nearby. But there is a catch: Luke argues that the boat is slowly sinking and they are nowhere near planes’ flightpath. Luke suggests that they swim to Turtle Island but it is approximately twelve miles away by swimming. I remember my jaw dropping because I can barely swim from one edge of a swimming pool to the other. Meanwhile, Warren, an experienced fisher and crewman, is adamant about not getting in the water because he knows there are all sorts of hungry creatures on the hunt. Those who decide to take a chance and swim promise to send rescue as quickly as possible. Eventually, a really big shark spots its lunch and makes an appearance. I found myself pulling my limbs toward my torso as it encircles the Australians. Suzie (Adrienne Pickering) squeals louder and splashes more violently by the second. I begged her boyfriend, Matt (Gyton Grantley), to slap some sense into her because she is endangering everybody. As scary as it is to see the shark go for the kill, I was more terrified when Luke dunks his head underwater to check the location of the shark relative to their position. At times we see the shark clearly and we know what to expect. But then there are instances when it is nowhere to be found and the camera lures us to look closer. 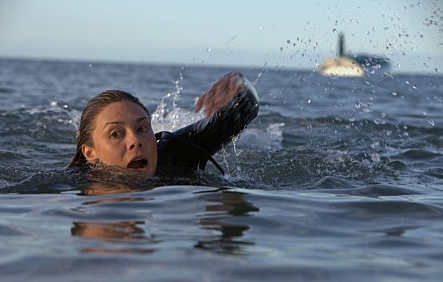 Although gore is inevitable, as in all movies with sharks eating people, “The Reef” focuses on the increasing dread so the shocks have bite and a bloody aftertaste. I loved this movie. One of the most intense movies I’ve ever seen. Best shark movie since “Jaws”. I was going to actually recommend this to you last night when you were considering a good horror movie for Halloween, but I figured this was more of a thriller than horror. How about “Open Water”? That was one pretty frickin’ intense. I remember watching that movie for the first time and I could not keep still. I prefer “Open Water” to “The Reef,” but they do make a really good double feature! No, “The Reef” was way better IMO. lol Just a “No”? I thought you’d put up more of a fight! Watching TV. lol. It was just more intense. I didn’t even know what was happening on “Open Water”. “The Reef” did a good job of showing you glimpses of a shark approaching, but not showing you too much. Open Water didn’t show anything, so I never really had an idea what was happening. For all I know a fish could have brushed against their foot and they would have had the same reaction had it been a shark. Open Water was intense, but if they had shown a glimpse of a shark it would have amplified the experience.